The Wnt/Wg pathway plays an important role in the developmental program of many cells and tissues in a variety of organisms. In addition, many Wnts and components of their downstream signaling pathways, such as β-catenin and APC, have been implicated in tumorigenesis. Over the past years, several genes have been identified as Wnt responsive, including c-myc, siamois, and cyclin D1. In order to identify additional genes responsive to Wnt signaling that contribute to the transformed phenotype, we performed a cDNA subtractive hybridization screen between a mouse mammary epithelial cell line that overexpresses Wnt-1 (C57MG/Wnt-1) and the parental cell line (C57MG). The screen identified a total of 67 genes to be up-regulated in response to Wnt signaling. Of these 67 genes, the up-regulation of 62 was subsequently confirmed by Northern and dot blot analyses (and, for a subset, semi-quantitative PCR) of RNA isolated from C57MG cells subjected to (1) an independent Wnt-1 retroviral infection, and (2) co-culture with Wnt-1 expressing cells. Among the confirmed Wnt-1 responsive genes, we further characterized a mouse homolog of the human transcription factor Basic Transcription Element Binding protein 2 (BTEB2), Wnt-1 Responsive Cdc42 homolog (Wrch-1), and Wnt-1 Induced Secreted Protein (WISP-1). 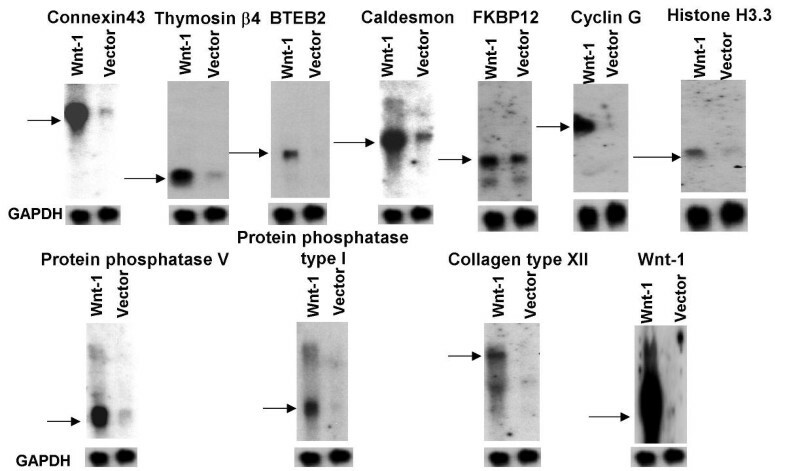 Several novel genes were identified in this screen, as well as others that have been shown previously to be regulated by Wnt signaling, such as connexin43. The results indicate that cDNA subtractive hybridization is a useful method for identifying genes involved in the process of Wnt-1-induced transformation. The Wnt/Wg signal transduction pathway is an evolutionarily conserved pathway that plays an important role in the developmental program of many organisms (for review see [1–4]). Genetic epistasis tests in Drosophila, in combination with biochemical experiments performed in Xenopus and in tissue culture cell lines, have contributed much information to the molecular mechanisms underlying Wnt signaling. In recent years, the discovery of the genes and their protein products that are involved in Wnt signaling has led to the development of a complex signaling network that includes various scaffolding proteins, kinases, and transcription factors. For a detailed description of the proteins involved, please see The Wnt Genes Webpage . With respect to the canonical Wnt/β-catenin pathway, in the absence of Wnt/Wg signaling, cells maintain low cytoplasmic levels of the oncoprotein β-catenin or Armadillo (Arm), its Drosophila homolog. β-catenin is a multifunctional molecule that acts at the plasma membrane in adherens junctions, can be found in the cytoplasm, and is also detected in the nucleus as part of a transcription factor complex. Upon phosphorylations at its amino terminus by an isoform of casein kinase 1 (CK1) and by glycogen synthase kinase-3β (GSK-3β), β-catenin is targeted for ubiquitin-mediated degradation by the "destruction complex" consisting of GSK-3β, the tumor suppressor protein adenomatous polyposis coli (APC), axin, and a member of the SCF ubiquitin ligase complex, β-TrCP/Slimb [6, 7]. In order to initiate signaling, Wnt must bind to its receptor Frizzled and its co-receptor LRP, leading to β-catenin stabilization. β-catenin levels now rise in the cytoplasm, reaching a critical amount that enables β-catenin to translocate to the nucleus where it interacts with Lef/TCF [8, 9] and activates target gene expression. Besides playing a role in differentiation and development, the Wnt/Wg signaling pathway has also been implicated in tumorigenesis . The Wnt-1 oncogene was originally discovered as int-1, a gene whose activation upon insertion of the mouse mammary tumor virus results in the formation of mouse mammary tumors [10, 11]. Although Wnt-1 is not expressed in the normal mouse mammary gland, expression of Wnt-1 in transgenic mice results in the formation of mammary tumors. In addition, overexpression of Wnt-1 in mouse mammary epithelial cell lines such as C57MG or RAC311 results in their transformation . Furthermore, in Rat1 fibroblasts, Wnt-1 overexpression induces serum-independent cellular growth in a manner that correlates with an increase in cytoplasmic β-catenin . These results suggest that perhaps Wnt-1-mediated transformation occurs through an increase in cytoplasmic β-catenin levels because transformation can take place in the absence of Wnt-1 signaling upon overexpression of a stable form of β-catenin. Other cell lines, such as NIH3T3 cells, have also been employed to study the response of endogenous β-catenin to Wnt-1 signaling and have arrived at similar conclusions: Wnt-1 signaling allows for accumulation of β-catenin to levels that enable it to form a complex with Lef/TCF proteins to activate transcription . Expression of some Wnts has been correlated with the development of human cancer. Recently, increased expression of Wnt-1 mRNA was observed in cell lines derived from a human gastric cancer (OKAJIMA), pancreatic cancer (BxPC-3), and in 50% of primary gastric cancers . The Wnt 2 gene is up-regulated at the mRNA level in gastric and esophageal carcinomas as well as in colorectal tumors at various stages . Wnt-5a mRNA is expressed at very low levels in breast cell lines and normal breast tissue, but benign proliferations and invasive cancers exhibit a ten-fold and four-fold higher level of Wnt-5a mRNA, respectively . Wnt-5a is also up-regulated at the RNA level in lung, breast, prostate carcinomas and melanomas . Wnt10B mRNA is elevated in primary breast carcinomas and in several noncancerous and cancerous breast cell lines . Finally, Wnt-13 mRNA is expressed in several adult tissues and in three human cancer cell lines: HeLa cells (cervical cancer) and in MKN28 and MKN74 (gastric cancer), potentially implicating this gene in tumorigenesis . Thus, the up-regulation of Wnts is correlated with the development of multiple tumor types, providing additional evidence that Wnt proteins and the pathway(s) they regulate play an important role in the control of cell growth and differentiation. Mutations in several components of the Wnt signaling pathway, such as APC and β-catenin, have also been linked to tumorigenesis. APC is a tumor suppressor gene that is mutated in up to 80% of human colon carcinomas . Mutations of APC result in the development of a form of inherited colon carcinoma called Familial Adenomatous Polyposis (FAP). Individuals with FAP develop multiple colonic polyps throughout their life, predisposing them to colon cancer. Elevated levels of β-catenin can also contribute to tumorigenesis. High levels of β-catenin are associated with several human cancers, including colon carcinomas, melanomas, pilomatricomas and hepatocellular carcinomas, either due to a nonfunctioning APC protein or to mutations that eliminate the phosphorylation sites within β-catenin [6, 22–25]. The diverse roles of Wnts in both development and tumorigenesis have fostered the search for Wnt responsive genes in these processes. Wg signaling in Drosophila is known to transcriptionally activate the expression of engrailed and Ultrabithorax through the Armadillo/dTCF complex [26, 27]. Besides these Drosophila homeobox genes, Wnt signaling through β-catenin in Xenopus results in the transcriptional induction of two additional homeobox genes, siamois  and twin . Other responsive genes of Wnt/Wg that are transcriptionally activated by β-catenin/Lef-TCF include the oncogenes cyclin D1 [30, 31], c-myc , and WISP-1 [33, 34]; c-jun and fra-1 , as well as the Xenopus fibronectin gene , connexin43 , matrilysin , BTEB2 , Wrch-1 , and membrane-type matrix metalloproteinase-1 (MT1-MMP) . The canonical Wnt signaling pathway relies upon the activation of responsive gene expression through the β-catenin/Lef-TCF complex in response to the binding of Wnt to its receptor Frizzled. Evidence exists, however, to suggest that Wnts can signal through a β-catenin/Lef-TCF-independent mechanism to activate downstream gene expression. These "non-canonical" pathways rely on either (1) the phosphatidylinositol (PI) pathway to activate protein kinase C (PKC) and raise levels of intracellular calcium (Ca2+) in order to regulate responsive gene expression (the Wnt/Ca2+ pathway)  or (2) Wnt signaling through Dsh and the JNK (the Wnt/PCP pathway) [43, 44]. For example, Xenopus Wnt-5a, a Wnt that does not induce ectopic axis formation nor stabilizes β-catenin, employs the Wnt/Ca2+ pathway to exert its effects . Thus, it is apparent that not all Wnts initiate the transcriptional activation of their responsive genes through the β-catenin/Lef-TCF complex, suggesting that β-catenin stabilization is not the sole end result of all Wnt signaling and that other pathways can be stimulated upon binding of Wnt to the Frizzled receptor. The current list of Wnt/Wg responsive genes contains primarily those genes whose expression is activated through the canonical pathway. In an attempt to identify additional downstream responsive genes of the Wnt signaling pathway that are relevant to transformation and potentially tumorigenesis, we performed a suppression subtractive hybridization (SSH) screen between a Wnt-1-expressing mouse mammary epithelial cell line (C57MG/Wnt-1) and the parental cell line (C57MG). SSH offers many advantages when compared to conventional methods, such as differential display (DD) and representational difference analysis (RDA), employed to identify mRNA and/or cDNA differences between two populations. Differential display is more suitable to different cell types rather than one cell type subjected to two different conditions, as differences in PCR amplification can make control mRNAs appear differentially expressed between two populations, and results are often not reproducible upon Northern blot analysis . Representational difference analysis  does not rely on suppression PCR to prevent the amplification of undesirable sequences. SSH, on the other hand, permits the rapid isolation of both rare and abundant messages from the tester population in two hybridization steps followed by two PCR reactions. It has been widely used over the past five years to identify syntenin and other TNF-inducible genes in endothelial cells , to contrast gene expression profiles between non-tumorigenic rat embryo fibroblasts and H-ras transformed cells , to identify differences between the bacterial genomes Escherichia coli and Salmonella typhimuriu , and to generate a testis-specific cDNA library, where rare sequences were enriched over 1000-fold in one round of subtractive hybridization . Using the technique of SSH, we previously reported the identification and characterization of a mouse homolog of BTEB2 , Wrch-1 , and WISP-1 [33, 34]. This report details the remaining results of the subtractive hybridization screen; in particular, the identification of 59 additional genes confirmed to be up-regulated in response to Wnt signaling. These results reveal the gene expression changes that occur in a tissue culture model system in response to Wnt signaling and may help explain the resulting transformed phenotype. In order to identify downstream responsive genes of the Wnt signaling pathway, suppression subtractive hybridization was performed between a cell line stably expressing Wnt-1 and the parental cell line that does not express Wnt-1. C57MG cells, a mouse mammary epithelial cell line, were chosen because they provide an appropriate in vitro model system for Wnt-1 signaling, and it is in this type of cell in the mouse mammary gland that aberrant activation of Wnt-1 results in mammary hyperplasia (see [12, 52, 53]). To achieve high levels of Wnt-1 expression, the C57MG cells were infected with a Wnt-1 retrovirus that contains the mouse Wnt-1 cDNA driven off the viral long terminal repeat promoter and a puromycin resistance selectable marker . Control infections for this experiment included C57MG cells infected with either an empty vector retrovirus or a Wnt-4 retrovirus. Wnt-4 is normally expressed in the developing mouse mammary gland and during pregnancy . Although Wnt-4 has been shown to cause Wnt-1-like hyperplasia in the mouse mammary gland , Wnt-4 has never been shown to cause transformation of C57MG cells [56, 57]. These cell lines will be referred to as C57MG/Wnt-1, C57MG/Wnt-4, and C57MG/Vector. Prior to performing the cDNA subtractive hybridization, the effects of Wnt-1 on C57MG cell morphology and on β-catenin levels were assessed. C57MG cells normally form a monolayer that is relatively cuboidal in shape . Upon expression of Wnt-1, the cells become elongated, refractile, and tend to overgrow one another at confluence, in contrast to that seen for C57MG/Wnt-4 and C57MG/Vector cells, which appear to be morphologically indistinguishable from the parental C57MG cell line (see [39, 52]). Thus, our infection of C57MG cells with a Wnt-1 retrovirus morphologically mimics that which has been reported . In addition to a morphology change, a consequence of Wnt-1 overexpression in C57MG cells is the stabilization and accumulation of cytosolic β-catenin. We first assessed the levels of cytosolic β-catenin in the retrovirally-infected cell lines to ensure that the Wnt-1 signaling pathway was functioning as expected in the Wnt-1-infected C57MG cells. Cytosolic β-catenin levels in the retrovirally-infected cell lines, and in the parental cell line, were determined through metabolic labeling and immunoprecipitation. The amount of β-catenin immunoprecipitated from the C57MG/Wnt-1 cells is approximately five-fold greater than that immunoprecipitated from the other three cell lines (data not shown; see ). These findings are in good agreement with that described by Shimizu et al. .
SSH allows for a comparison between two populations of mRNA in order to identify genes that are more highly expressed in the cell of interest, called the "tester" population. For our experiments, the tester population was created by obtaining mRNA from the C57MG/Wnt-1 cell line, and the gene expression profile in these cells was directly compared to that of the "driver" population, mRNA from the C57MG parental cell line. SSH allows for an equalization of the high- and low-abundance responsive sequences within the single-stranded tester population . The relative concentrations of low-, medium-, and high-abundance responsive sequences in the differentially expressed tester hybrids was approximately 27%, 35%, and 37% of the total double-stranded tester population, respectively . The fact that these values are similar demonstrates the ability of this technique to effectively normalize different abundances of mRNAs in a given population. C57MG cells which had been stably expressing Wnt-1 for three weeks after retroviral infection and that were ≥95% confluent were chosen for this analysis as this type of experiment would allow for the identification of both direct and indirect responsive genes to Wnt-1 signaling and would allow us to assay the mitogenic effects of Wnt-1 on these cells, respectively. Two thousand colonies were picked, of which 1384 had inserts that could be sequenced. Of these, 1195 clones were grouped into 240 clusters (a cluster consists of two or more clones) based on identity and/or at least a fifty bp overlap using the BLAST program to find DNA and protein matches. 131 clones out of the total 1384 templates could not be grouped into a cluster (only one clone was obtained for these). Thus, 371 different cDNAs were obtained from 1384 templates. Furthermore, 58 clones out of the 1384 templates had unreadable sequences, and thus were not pursued further. 39% of the templates (145 unique cDNAs) could be grouped into clusters consisting of sequences having known protein matches (32%) or known protein homologs (7%). Sixty-one percent (61%) of the templates (226 unique cDNAs) were grouped into clusters containing sequences having an EST match to an unknown gene (32%) or which had no database match (29%). Therefore, almost two-thirds of the analyzed clones represent potential novel responsive genes of Wnt-1 signaling. It is possible that this high percentage of unknown clones may be due to a bias in the EST database towards gene expression in normal tissues in that those genes which may be preferentially activated upon transformation are not included in this database. The screen appears to have been successful in its ability to use the suppression PCR effect to reduce the degree of amplification of undesirable sequences. For instance, very few clusters consisted of ribosomal RNAs, which should be found at comparable levels in both C57MG/Wnt-1 cells and the parental C57MG cells. Furthermore, Wnt-1, a gene of high abundance in the tester cell line, was normalized as far as its subsequent detection during the subtractive screen. These results confirm the ability of the screen to equalize low-, medium-, and high-abundance mRNAs, and, in particular, to identify low-abundance mRNAs as potential Wnt-1 targets. In addition, some of the genes identified in the screen (BTEB2 , connexin43 , WISP-1 [33, 34], and Wrch-1 ) have recently been shown (by our lab and others) to be veritable responsive genes to the Wnt signaling pathway. In addition, recent microarray experiments [59, 60] have identified many of the same genes that have been observed to be up-regulated in our screen. Of the genes listed in Table 1, only the following were not identified by Willert et al. : cdk4 binding protein, DUB1, FIN16, FKBP12, histoneH3.3, thymosinβ4, tob5, HP1.BP38, GKLF, BTEB2, proteasome.comp.C8, protesome.iota, EI24, IGF BP5, Fat-like gene, URE B1, rhoB, actin, collagen XII, N-cadherin, Wnt-5A-like gene, ERK3, rat GAP, glucose-regulated protein 78, protein phosphatase inhibitor-2, protein phosphatase type I, PTPase 2, Wrch-1, and WISP-1. The identification of genes in common among the published screens lends credence to our screen data and suggests that SSH is a useful method by which to identify novel responsive genes of this signaling pathway. Wnt-1 induced gene database. This table summarizes the list of putative Wnt-1 responsive clones identified in the screen, including accession numbers of genes to which the sequences have homology, as well as the results obtained for each clone by Northern blot and dot blot analyses (in some cases for the latter, results from two experiments are indicated in the "Results – dot blot" column and are separated by a comma). Signals were quantified using a PhosphorImager. The value in the "Results" column for "Northern Blot" is the measure of the ratio of the signal for each gene in the Wnt-1 cells (normalized to GAPDH) to the signal for each gene in the control cells (normalized to GAPDH). The table also indicates whether the gene has been confirmed by semi-quantitative RT-PCR analysis as a true Wnt-1 responsive gene. A description of the function of each gene is listed in the last column of the table. "nd" means that no signal was detected. "inc" means increase in gene expression in the Wnt-1-treated sample, with no detectable signal in the control. 39% of the sequences identified had a known protein match or a known protein homolog in the database, and sixty-seven of these clones were chosen for further analysis. Clones that tested positive in the independent assays described below were grouped into categories based on putative function. Many of these clones share homology with transcription factors, implying that the putative Wnt-1-induced gene expression profile obtained from this screen consists not only of genes activated directly by the β-catenin/Lef-TCF complex, but also genes activated in response to these transcription factors. Therefore, this profile contains direct response genes to Wnt-1 signaling, transcriptionally activated in a β-catenin-dependent and -independent manner, as well as secondary response genes which are activated after the immediate response genes. Some of the putative transcription factors that are responsive to Wnt-1 signaling include clones having homology to elf-1 (an Ets-family transcription factor), E2F1, HMG14 (a protein that specifically binds the nucleosome), and to a mouse homolog of human BTEB2 (a member of the Sp1 family of transcription factors). Other gene categories include differentiation, calcium-related, proteolysis-related, p53-related, GTP binding proteins, and an "other" grouping for those clones that could not be classified in the above categories. Taken together, these results provide an array of potential candidate genes involved in the transformation of C57MG cells in response to Wnt signaling. Recently, other groups have identified responsive genes to Wnt signaling through the use of cDNA microarrays in various systems [60, 61]. Not surprisingly, the gene profile identified in these systems is not entirely identical to that obtained from our research, as each experimental setup differs slightly in both the conditions under which the observations were made, as well the method by which the differential gene expression was assessed. Nonetheless, this research has helped elucidate the molecular components of Wnt signaling responsible for a given phenotype. In order to confirm the results of the screen, C57MG cells were infected with a Wnt-1 or empty vector retrovirus and passaged in tissue culture for three weeks to mimic the conditions under which the original screen was performed. After this time period and when cells were approximately 95% confluent, RNA was isolated from the Wnt-1-infected cells (C57MG/Wnt-1) and empty vector-infected cells (C57MG/Vector), and Northern blot analysis was done using probes prepared from the sequences. Results from several of these Northern blots are shown in Figure 1. The Northern blots show that the screen yielded many genes that are up-regulated to varying levels. Connexin43 showed greater than twenty-fold induction in response to Wnt-1 signaling, and the remaining clones were induced less than ten-fold. Thymosinβ4, cyclin G, caldesmon, BTEB2, protein phosphatase V, and histone H3.3 are found at higher levels in the C57MG/Wnt-1 cell lines compared to the C57MG/Vector control. FKBP12 showed very little change in mRNA expression levels between the two cell lines. This result suggests that SSH can identify subtle differences in transcript levels between two cells lines. Therefore, we have identified a group of genes which are up-regulated in the presence of Wnt-1 signaling three weeks after Wnt-1 retroviral infection. These genes may or may not be direct responsive genes of Wnt-1 signaling, as many of these genes may be activated as a secondary cascade of gene expression in response to Wnt-1. Northern blot analysis of putative Wnt-1 responsive genes after retroviral infection of C57MG cells. C57MG cells were independently infected with either a Wnt-1 or empty vector retrovirus. Forty-eight hours post-infection, cells were split into media containing 2.5 μg/ml puromycin. Infected cells were passaged in the presence of puromycin for three weeks after which time total RNA was isolated from each cell line when cells were approximately 95% confluent. Northern blot analysis was performed using five μg of total RNA, and probes were prepared from the sequences obtained. Blots were subsequently probed for GAPDH. Signals were quantitated using the PhosphorImager. The fold induction of the candidate genes is listed in Table 1, a Wnt-1-induced gene database that summarizes the results of the Northern blot, differential screening, and semi-quantitative PCR experiments, along with a brief description of each gene and the accession number to which each clone has homology. For each experiment, the number reported is the normalized ratio of the signal found in the C57MG/Wnt-1 cells to the signal found in the C57MG/Vector cells (signals were normalized to GAPDH prior to taking the ratio). Of the 67 putative Wnt-1 induced clones examined by Northern blot analysis, approximately 93% (62) are induced 1.5-fold or greater in the presence of Wnt-1 signaling. The remaining 7% of the clones were induced less than 1.5-fold or were not detected in the assays used to confirm up-regulation. Several of the clones confirmed by Northern blot analysis were also found to be up-regulated in the C57MG/Wnt-1 cells by semi-quantitative RT-PCR (QRT-PCR) analysis performed on the same RNA prepared for use in the previously described Northern blot experiments. A list of these genes is found in Table 1, and Figure 2 shows typical QRT-PCR results for four genes: an unknown gene (483), Wrch-1, BTEB2, and IGF-BP5. In this experiment, different amounts of RNA were subjected to QRT-PCR using the TaqMan method (Applied Biosystems). Each gene analyzed shows a higher expression level in the C57MG/Wnt-1 cell line than in the parental C57MG cell line. Wrch-1 and IGF-BP5 show striking patterns of expression in that they are barely detectable in the C57MG cell line. BTEB2 and the unknown gene 483 are also expressed at higher levels in the C57MG/Wnt-1 cell line, although expression of each gene can be detected to some extent in the parental cell line. In general, the QRT-PCR data are in good agreement with the results obtained by Northern blot analysis, and overall the QRT-PCR technique offers a more sensitive and quantitative approach to assess changes in gene expression levels. In some cases good probes for Northern blot analysis could not be prepared and/or little change was observed in transcript levels between the cell lines; however, the ability to perform QRT-PCR for these candidates enabled us to determine if these genes were responsive to Wnt signaling (for example, thrombospondin and FKBP12, respectively). Semi-quantitative RT-PCR (QRT-PCR) confirmation of putative Wnt-1 responsive genes after retroviral infection of C57MG cells. C57MG cells were infected with either a Wnt-1 or empty vector retrovirus. Forty-eight hours post-infection, cells were split into media containing 2.5 μg/ml puromycin. Infected cells were passaged in the presence of puromycin for three weeks after which time total RNA was isolated from each cell line. Reverse transcription was performed on the indicated amounts of total RNA, followed by PCR using primers designed for each sequence of interest and TaqMan probes (Applied Biosystems). triose phosphate isomerase (tpi) was used as a control in each QRT-PCR experiment. Several of the Wnt-1 responsive genes that had been confirmed by independent retroviral infection of C57MG cells were subsequently tested in a co-culture assay to determine their time course of expression in response to Wnt-1 signaling (see  for culture details). Co-culture assays were carried out for various times in which C57MG cells were plated together with QT6 or QT6 cells expressing Wnt-1 (QT6Wnt-1), and Northern blot analysis was performed using total RNA isolated from the co-cultures and probes for the genes of interest (see Table 2). A series of random clones that showed good induction by retroviral infection, as well as several of the transcription factor clones, were chosen for analysis. The transcription factor genes were chosen for analysis in the co-culture assay because it was hypothesized that they would be immediately activated in response to the Wnt-1 signal, given the ability of other signaling pathways, such as the mitogen-activated protein kinase (MAPK) pathway, to first activate the transcription of genes encoding transcription factors. This initial wave of gene expression could then contribute to the transcriptional activation of other genes in the pathway. Summary of co-culture time course data. C57MG cells were co-cultured with QT6 or QT6Wnt-1 cells for the indicated times. Total RNA was isolated from each co-culture, and Northern blot analysis was performed using probes to the selected genes. Signals were quantified using a PhosphorImager. The reported value (fold induction) is the measure of the ratio of the signal for each gene in the Wnt-1 co-culture (normalized to GAPDH) to the signal for each gene in the control co-culture (normalized to GAPDH), averaged from three independent experiments. Zero (0) indicates that no detectable difference in gene expression was observed between the Wnt-1 and control co-cultures. "inc." signifies an increase in gene expression in the Wnt-1 co-culture, with no detectable signal in the control co-culture. Negative values indicate a decrease in expression. The results of the co-culture assay were striking, particularly because several of the genes which were up-regulated in response to Wnt-1 signaling in the retroviral infection assay were not up-regulated early in the co-culture assay (over a forty-eight hour time period). For example, connexin43, a known responsive gene of Wnt-1 signaling [37, 63], was strongly induced in C57MG cells infected with the Wnt-1 retrovirus after three weeks in culture, but only modestly induced (approximately two-fold) after forty-eight hours of co-culture. Other Wnt-1 responsive genes identified by retroviral infection were only slightly up-regulated in the co-culture assay, such as protein phosphatase V, SPARC, and thrombospondin. One responsive gene, thymosinβ4, was induced eight-fold in the retroviral infection assay but was not induced in a co-culture assay carried out from six to forty-eight hours. Furthermore, two clones, collagen XII and BTEB2, were up-regulated two to three hours after co-culture and in the retroviral infection assay. Finally, of the three transcription factor clones (all of which were induced in the retroviral infection assay), only one (BTEB2) demonstrated transcriptional activation throughout the co-culture assay. This discrepancy in gene expression levels probably reflects the temporal difference in the retroviral infection versus co-culture assay, and may also be due to other factors produced by the Wnt-1-expressing cells. Differential screening (dot blotting) was performed on retrovirally infected C57MG cells in order to provide an independent method for confirming the results of the screen. Wnt-1 and empty vector retroviral infections were carried out in C57MG cells for three weeks, and labeled cDNA was prepared from each cell type and hybridized to the prepared membranes. Table 1 includes the results of the dot blot assay that are reported as fold activation. Overall the results are in good agreement with those obtained for the Northern blots performed after the retroviral infection of C57MG cells. In general, those genes up-regulated by retroviral infection (as determined by Northern blot analysis) are also up-regulated (albeit not always to the same level) in the differential screening assay. Some discrepancies do exist in the data, however, with some genes found to be more highly up-regulated by Northern blot analysis as opposed to the levels detected in the differential screening experiment. This might be due to the spotting method of each clone onto the nitrocellulose membrane, giving rise to an uneven representation. Differential screening was used to identify which putative Wnt-1 responsive genes were also up-regulated in the presence of high levels of β-catenin. A stable C57MG cell line was generated that overexpresses a stable form of β-catenin having two mutations which convert threonine 41 and serine 45 to alanine residues . We have chosen to use these β-catenin cells because they consistently maintain high levels of stabilized β-catenin expression. This would enable us to compare and contrast the gene expression in response to Wnt signaling through a co-culture assay to that obtained in response to the expression of high levels of β-catenin only. Differential screening was performed using cDNA isolated from the β-catenin stable cell line and from a QT6Wnt-1+C57MG cell twelve hour co-culture. The following genes were tested in this assay: BTEB2, nucleoporin, Wrch-1, GKLF, tra1, elf-1, HP1.BP38, tlm, cul-2, activin, FIN16, tob5, calponin, calmodulin, IGF BP5, EI24, thrombospondin, proteasome component C8, fibronectin receptor, GDP dissociation inhibitor, rab11b, Wnt-5A, WISP-1, WISP-2, WISP-3, thymosinβ4, and connexin43. In this assay, Wnt-1 signaling was demonstrated to up-regulate BTEB2, nucleoporin, and Wrch-1 only, while GKLF and tra1 are only up-regulated in the presence of high levels of β-catenin. Table 3 shows that, of the genes tested, the majority are up-regulated in both the Wnt-1 co-culture and the stable β-catenin cell line. Included in this category are two known Wnt-1 and β-catenin responsive genes, connexin43  and WISP-1 [33, 34]. Identification of Wnt-1 and β-catenin responsive genes in a twelve hour co-culture assay and a stable cell line overexpressing the non-degradable β-catenin mutant 4145β-catenin. Differential screening was performed using labeled cDNA isolated from a twelve hour Wnt-1 co-culture and a stably transfected C57MG cell line that overexpresses the stable β-catenin mutant 4145β-catenin. The labeled cDNA was hybridized overnight with membranes spotted with the putative Wnt-1 responsive sequences. Signals were quantified using the PhosphorImager, and the genes were classified based on their response to Wnt-1 signaling and high levels of β-catenin. cDNA subtractive hybridization has identified several putative Wnt-1 responsive genes at the mRNA level in a mammary epithelial cell line that overexpresses Wnt-1 (C57MG/Wnt-1). 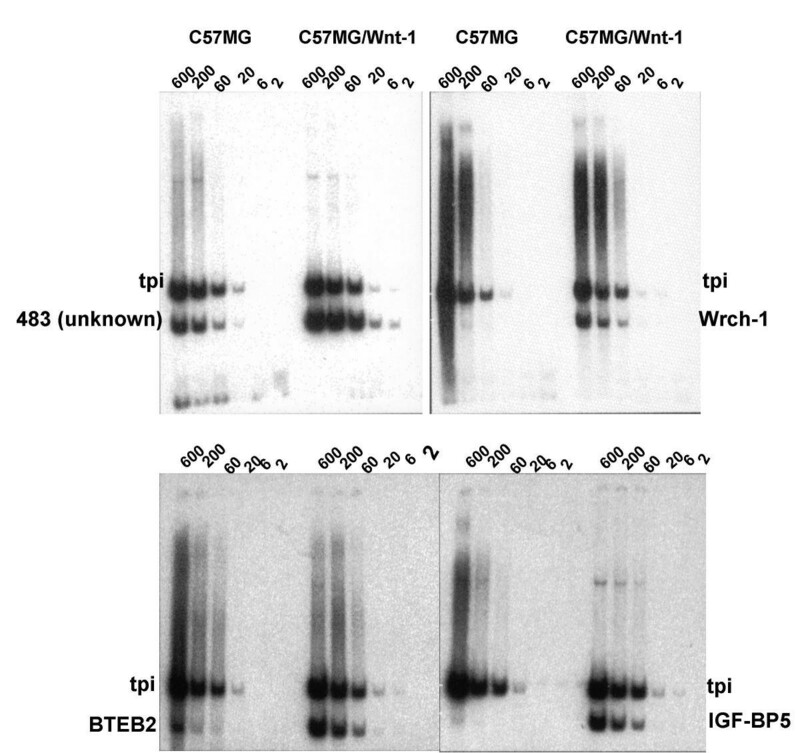 The up-regulation of these candidate genes was confirmed by Northern blot analysis and differential screening of material isolated from three independent sources: 1) C57MG cells infected in an independent retrovirus infection assay, 2) co-culture of C57MG cells with a cell line that overexpresses Wnt-1 (QT6Wnt-1), and 3) C57MG cells that overexpress a stable form of β-catenin. In addition, some of these putative Wnt-1 responsive genes were confirmed by semi-quantitative RT-PCR analysis using RNA obtained from C57MG/Wnt-1 cells and the parental C57MG cells. Independent retroviral infection of C57MG cells with a Wnt-1 or empty retroviral vector confirmed that, of the 67 genes subjected to Northern blot analysis, QRT-PCR and/or differential screening, approximately 93% (62) were up-regulated ≥1.5-fold by Wnt-1 signaling. Signaling pathways give rise to a cascade of gene expression, with the immediate response genes being activated first, usually in the absence of any new protein synthesis [64–66]. The function of such immediate response genes ranges from regulators of the cell cycle to acting as transcription factors [67, 68]. The initial activation of transcription factors then permits the activation of a second wave of gene expression, the early or middle response genes [64, 69]. The late response genes are activated last, and may or may not be transcriptionally regulated by the early response genes [70, 71]. In the case of Wnt-1 transformation of C57MG cells, we hypothesized that these late response genes may function to maintain the transformed state of these cells throughout their lifetime in tissue culture. Therefore, the screen was performed using C57MG cells that had been stably expressing Wnt-1 for approximately three weeks to ensure the identification of all three categories of response genes. In addition, total RNA was extracted when cells were approximately 95% confluent to ensure the effects of Wnt-1-induced transformation and to enable us to determine how gene expression is regulated in response to the mitogenic effects of Wnt signaling. It is evident to us, however, that by using this time point of three weeks, we may potentially miss identifying some immediate (and perhaps early) response genes that are only transiently activated in response to Wnt signaling, as such genes may not remain induced over such an extended period of time. In addition, as is true of all non-saturation screens, some known targets of Wnt signaling were not identified, such as cyclin D1. We recognize that this is a limitation of the screen methodology but are still encouraged by the number of Wnt responsive genes that we have identified. The sequences having database homology and that were confirmed to be up-regulated in response to Wnt signaling in one (or more) of the independent assays could be categorized based upon their putative function as follows: cell cycle exit/differentiation, transcription factors, calcium-related, ECM/cytoskeleton, p53-related, GTP-binding proteins, ubiquitin-related, and other. One category of interest was that of the transcription factors, as these might include 1) genes activated, along with β-catenin, to mediate responsive gene expression and/or 2) novel β-catenin responsive genes. We believe that the identification of a battery of transcription factors up-regulated in response to Wnt signaling may aid us in developing a model in which the activation of these transcription factors, along with the β-catenin/Lef-TCF complex, mediates the up-regulation of other genes by Wnt signaling, including those identified in our screen. Another category of interest consisted of several genes involved in remodeling the extracellular matrix (ECM) and the cytoskeleton. The identification of these genes as potential Wnt-1 responsive genes is interesting in light of the ability of Wnt-1 to radically alter the morphology of C57MG cells, a process that involves changing the cytoskeleton of these cells and their surrounding ECM. Finally, connexin43 was identified as a putative responsive gene of Wnt-1 signaling in our assay. The identification of this gene as a responsive gene of the Wnt-1 signaling pathway is expected given previous evidence that it is a veritable Wnt-1 target  and lends credence to the ability of the screen to identify true responsive genes of the Wnt-1 signaling pathway. Several of the genes confirmed by independent retroviral infection of C57MG cells, along with the putative transcription factors, were chosen for analysis in the co-culture assay. The co-culture assay was performed in two phases, an early co-culture of one to four hours, and a later co-culture of six to forty-eight hours. Several of the Wnt-1 responsive genes highly up-regulated by retroviral infection were not induced in the co-culture assay. At first this result seemed surprising, but it can probably be explained by the conditions under which these genes were identified: the screen, as well as the independent retroviral infection, was performed on cells that had been passaged in tissue culture for three weeks after Wnt-1 retroviral infection. Concomitant with the co-culture assay, differential screening was employed in order to confirm the screen results. Many of the genes confirmed by independent retroviral infection through Northern blot analysis were also found to be induced in the differential screening assay using C57MG cells infected with a Wnt-1 retrovirus as the starting material. Although the fold induction was not identical for both assays, this is to be expected given that the methodology for each is different. Furthermore, differential screening relies upon the ability of RNA to be converted to labeled cDNA and for each gene to be equally represented, in excess, on the nitrocellulose membrane, in order to hybridize with the labeled cDNA. Given these caveats, it is not surprising to see differences between the fold activation for each gene as determined by Northern blot analysis and differential screening. The conversion of RNA to labeled cDNA assumes that all transcripts will be converted and labeled with the same efficiency by the reverse transcriptase enzyme. It is highly possible that some transcripts will be more difficult to convert to cDNA given the nature of their sequence. This would give rise to an unequal representation of particular transcripts within the cDNA mixture and could explain the differences observed in fold activation by the differential screening method. These inherent limitations to the differential screening technique must be taken into account and hence the results should be confirmed by Northern blot analysis and/or QRT-PCR to determine if in fact the gene is regulated by Wnt-1 signaling. The differential screening assay was also performed with a C57MG cell line that stably overexpresses a non-degradable β-catenin mutant, and the results were compared to those found for a differential screening assay conducted with a twelve hour QT6Wnt-1+ C57MG co-culture. Several of the genes transcriptionally up-regulated by the Wnt-1 co-culture were also found to be up-regulated by overexpressing β-catenin. This is to be expected, given that the canonical Wnt-1 signaling pathway relies upon the β-catenin/Lef-TCF transcription factor complex to mediate the activation of downstream responsive genes. These results provide us with a molecular signature of the changes that occur in a mammary epithelial cell line (C57MG) upon transformation by Wnt-1. Although it is not possible to distinguish between genes induced directly and indirectly by Wnt signaling using the methods described herein (because we looked three weeks after retroviral infection and also did not analyze the promoters of the identified genes for putative TCF binding sites), the techniques utilized here still have provided us with a useful tool to rapidly assess changes induced during the transformation phenotype. With these results in hand, we now have a snapshot of the gene expression changes that take place after three weeks of Wnt-1 overexpression, and we can use this information to understand how the protein products of these up-regulated genes help establish and/or maintain the transformation phenotype. We surmise that many changes take place in the cell upon reception of Wnt, including, on a molecular level, the activation of various downstream signaling pathways mediated by other transcription factors, calcium, phosphatases, and GTP binding proteins. These in turn go on to activate other genes that lead to the morphological changes apparent upon transformation; for example, the activation of various ECM and cytoskeletal proteins to remodel the cell architecture. It is possible that such a model can be used to investigate the roles of Wnts, and how they transduce their signals, in other systems. Information with respect to cell culture techniques and reagents can be found in [33, 34, 39]. Total RNA was isolated from cells at high degrees of confluency (≥95%) and Northern blot analyses were carried out as described . SSH was performed using the PCR-Select cDNA Subtraction Kit (CLONTECH). Tester double-stranded cDNA was synthesized from 2 μg poly(A+) RNA that was isolated from the C57MG/Wnt-1 cell line. Driver double-stranded cDNA was isolated from 2 μg poly(A+) RNA from the C57MG parent cell line. After the subtractive hybridization, the subtracted cDNA was subcloned into the pGEM-T vector for further analysis. For additional information with respect to SSH, please see [33, 72–74]. Five (5) μg of DNA of each of the putative Wnt-1 responsive clones were spotted onto nitrocellulose membranes and baked for two hours at 80°C under vacuum. Poly(A+) RNA was prepared from either C57MG cells infected with Wnt-1 or the empty vector retrovirus, C57MG cells stably expressing a the T41A, S45A stable mutant form of β-catenin (4145 β-catenin), or C57MG cells co-cultured with QT6 or QT6Wnt-1 cells. 2 μg of poly(A+) RNA was converted to labeled cDNA in the presence of oligo(dT), random hexamers, unlabeled ATP, CTP, GTP, UTP, reverse transcriptase, and [32P]CTP. Prehybridization, hybridization, and washing procedures were followed as per the Northern blot procedure described previously . The membranes were exposed to a STORM PhosphorImager (Molecular Dynamics/Amersham Pharmacia Biotech) and quantitated using the ImageQuant program (Molecular Dynamics/Amersham Pharmacia Biotech) based on the ratio of each signal in the Wnt-1-treated cells to the signal in the control-treated cells (each normalized to GAPDH). QRT-PCR was performed using varying amounts of total RNA in accordance with the TaqMan protocol (Applied Biosystems). Immunoprecipitation was performed as previously described in . This work was supported by the NIH Cancer Training Grant T32 CA-09528. L. Taneyhill was supported in part by a fellowship from the New Jersey Commission on Cancer Research (98-2001-CCR-00). The authors would like to especially thank Dr. Arnold J. Levine for his support and encouragement of this work. Finally, the authors would like to thank Dr. Marianne Bronner-Fraser for her editorial assistance and helpful suggestions. LT carried out all of the molecular studies and experiments described herein, with the exception of the actual screen process, sequencing, and QRT-PCR experiments that were performed by DP. LT, in conjunction with Dr. Arnold J. Levine, conceived of the study and participated in its design and coordination. All authors read and approved the final manuscript.